This is a reminder to set your DVR’s for this Thursday’s season finale of The Big Bang Theory. CBS just released the promo for the big finale and it looks like it’s going to be hard to watch. Leonard is going away and he’s left before, so it’s nothing to freak out about. Yet. For Sheldon, the news of losing his roommate is harder than he thought it would be. Sheldon can come across as an uncaring and oblivious guy, but he really does have a heart. Last week’s episode is proof enough of that. Leonard asks Penny to take care of Sheldon while he’s gone. “Remember what happened when I took care of your goldfish?” Penny reminds Leonard. “Flush Sheldon down the toilet and get me a new one,” Leonard shrugs. I foresee a lot of “Soft Kitty” singing in Penny’s future. It looks like everyone is settling in for the summer and getting ready for a long vacation. Howard and Raj have some big scenes and Penny has to grapple with Sheldon while saying goodbye to her boyfriend at the airport. No, officers, she’s not smuggling drugs. She’s just saying goodbye to her boyfriend. Also, Penny and Raj have a big crying scene, for more than just one reason. 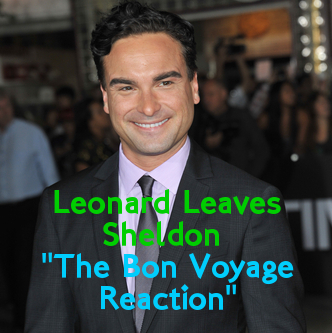 What will Sheldon do for the summer without Leonard? He won’t have to live within the confines of the infamous roommate contract. Oh, who are we kidding. He’s going to be living within the strictest confines of the Sheldon life code. Without Leonard around to assimilate Sheldon into social life, things might get a little hermit-like for Sheldon. Let’s just hope that Amy Farrah Fowler can bring him out of his shell.